Sept. 13, 1996. It didn’t truly hit home until the following day. Having traveled to Philadelphia on Sept. 13 with my mother, grandmother and brother, we heard the news together on the radio — Tupac Shakur dead of gunshot wounds. I was 10. That Saturday, Sept. 14, my grandma’s cousin’s man, Arcenio, walked me to a Germantown spot to grab a cheesesteak. The blocks were lined with men and women. 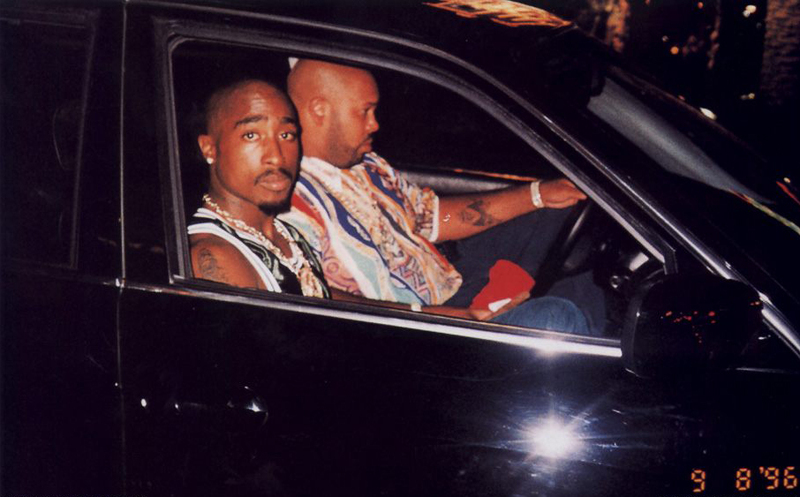 Some were drinking, and “pouring out a little liquor,” as ‘Pac had advised on 1994’s Thug Life Vol. 1. To my eyes, some did weird things with their fingers — rolling blunts. A lot of people openly wept as Shakur’s music blasted from car stereos and apartment windows. I recall in particular the song “Ambitionz Az A Ridah” from his Death Row Records debut 1996’s All Eyez On Me, released just seven months before he died. That was Death Row. That was Suge Knight’s influence. That was slow-cooked paranoia, simmering for months in a maximum-security prison for a crime he swore he did not commit. That was the rage of having been shot five times entering a New York City elevator. And feeling the hit was an elaborate setup. That was Tupac. We argued on the playground about what side we pledged allegiance to. Some chose Biggie and Bad Boy. Others, like myself, chose ‘Pac and Death Row. Though he seemed much older at the time, Tupac was 25 at the time of his death. But what we didn’t know, in the final days of his life, was how rap’s bravest prizefighter fought a losing battle. We didn’t know his last words were, perhaps, the most Tupac Shakur-like words ever, when he told the first cop on the scene, “F— you,” after he was asked who shot him. We didn’t know a lung, shredded by bullets a week earlier, had to be removed. We didn’t know he lost a finger. We didn’t know his head had swollen to twice its normal size due to fluid in his brain. We didn’t know Tupac received death threats in the hospital as he battled death itself. We didn’t know that as his closest loved ones visited him in his final hours, his skin felt ice-cold. We didn’t know until his mother, Afeni Shakur, revealed later that she witnessed her son being revived several times before she finally decided to let Tupac discover, firsthand, if heaven indeed had a ghetto. Forget the music he never got to record — though he left behind hundreds of unfinished songs — what’s difficult is visualizing the life he never lived. He died without having exonerated himself from the sexual assault charge that landed him in a maximum-security penitentiary for much of 1995, a crime he vehemently and repeatedly denied both on wax and through interviews. And though it is hoped that they have in the afterlife, the world was never able to experience a ‘Pac and Biggie reconciliation. It’s that word, “influence.” The truth of it. Look no further than Allen Iverson’s recent Basketball Hall of Fame induction speech, during which he thanked Tupac, Biggie, Michael Jackson, Jadakiss and Redman for crafting the soundtrack to his turbulent career. Or Sprite using Keep Ya Head Up in its latest ad campaign. Willow Smith wishes he was still alive. Or when my mother texted me in tears last Wednesday saying she couldn’t get out the car because Dear Mama — her ringtone for me — was on the radio. Even in death, Tupac hasn’t died. He’s someone whose words have elicited strength I never knew existed in me. His love for his mother has only helped put into context, and to some degree even deepen, my understanding for my love for that of my own. Tupac made me proud to be black, much like Marvin Gaye did for him — and proud to love black women. Being young and black and from a single-parent household, and having the courage to defy the stereotype of being “another statistic” in a society that doesn’t have high hopes for me, is thanks in large part to Tupac. He was a father figure of sorts. Filling in empty spaces through lyrics such as Now ain’t nobody tell us it was fair / No love for my daddy ’cause the coward wasn’t here / He passed away and I didn’t care / ‘Cause my anger wouldn’t let me feel for a stranger. He’s the third most important older dude in my life actually, after my uncle John (who died from colon cancer in 1999), and my cousin Terry. So forgive me if over the past 7,306 days I’ve consistently imagined what his final thoughts might have been, in his first-floor Las Vegas hospital room, as he lay strapped to machines barely keeping him alive, before he ascended to Thugz Mansion. Damn, is this really it? How long will they mourn me? They got Malcolm at a podium. They got me in a BMW. We both saw it coming. Do these people know I love them? I should’ve listened to Kidada when she told me to put on my vest. How will they speak about me if I’m not here to defend myself? Was this rap s— even worth it? I never got to tell my mama I love her. I guess it is like I told Tabitha Soren. This is how I’ma die. No screams. Just fading out. We thought we knew Tupac Shakur when he died 20 years ago today. We’re grown now. Some of us are married. Some have kids. We know what it means to get around. We know what we’d do for love. We know that some of the issues he championed against — police brutality, poverty and violence against women — are more visible than when he was alive. But what we didn’t know, then, was who in death Tupac Shakur would become. Rap’s most vibrant religious figure. Its most flawed prophet. But most importantly, ours forever.